Monday Online Studio is here! Oil, 30" x 40", Sold. I am completely in denial that summer is coming to an end. In fact, I have decided to adopt my youngest son's schedule. He doesn't start college until October 2nd so I am going to enjoy my summer until then! Plus, we are hosting a wedding at our home this week and the Thirty Paintings in 30 Days Challenge starts in six days. It's a very busy time! 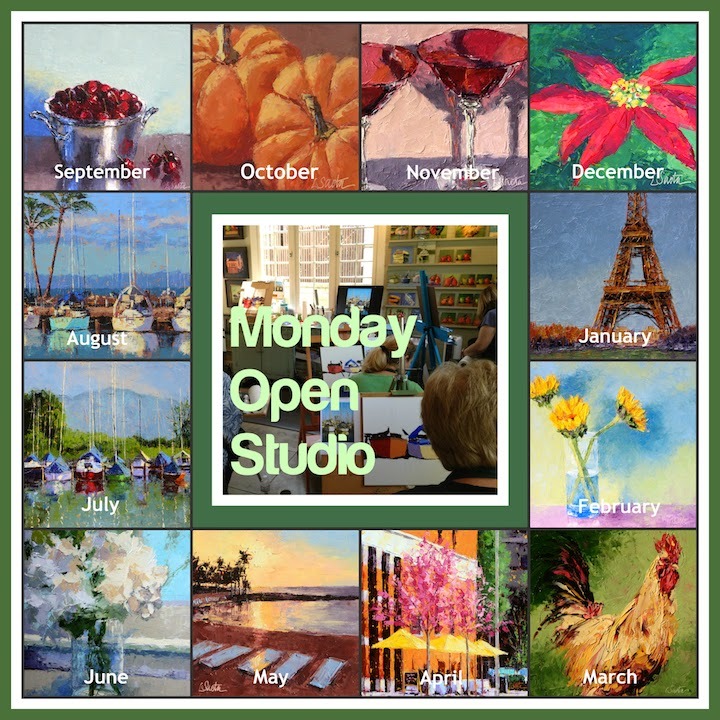 Last year I started teaching a Monday Open Studio in South Pasadena. It's been a lot of fun and the art painted in the classes has been amazing! So many of you have asked if I would teach palette knife painting online and I have finally made it happen! I am now offering Monday Online Studio. Monday Online Studio consists of videotaped demonstrations that take you through the experience of a full day of painting. The video starts with the selection of subject matter which might include setting up a still life and showing how I photograph my subjects. It may show how I photograph boats on a pier. The next step is setting up the composition on canvas, followed by how I premix my color palette. Then I paint the entire painting with a palette knife which includes blocking in the shapes of my painting, matching values and temperatures, adding detail and finishing with highlights. The Monday Online Studio begins in October 2014. One class is offered per month and it will always be released on the first Monday of the month. When you sign up you will be given access to the inspiration photo plus a link to the online video demonstration. The video will range in length from two to five hours. You can take your time and finish the painting anytime! Once you have completed your painting you can upload it to my blog. If you want you can link your uploaded photo back to your website for increased visibility. Finally, all twelve themes for the Monday Online Studios were chosen so at the end of 12 months you will have 12 paintings suited for a 2016 calendar! You can sign up for one class or all twelve. If you sign up for all 12 then there is a 35% discount. For more information visit the Monday Online Studio website. I will be releasing my 2015 workshop schedule next week! I am coming to Cape Cod, Atlanta, Charlotte and Richmond in 2015! Plus you can paint and stay with me in Ventura, CA at the beach house! Click here for more information! I am offering Monday Online Studio painting classes beginning October 2014! Join me each month as we paint boats, roosters, glass, beach scenes, umbrellas, etc. with a palette knife! Click here to sign up!